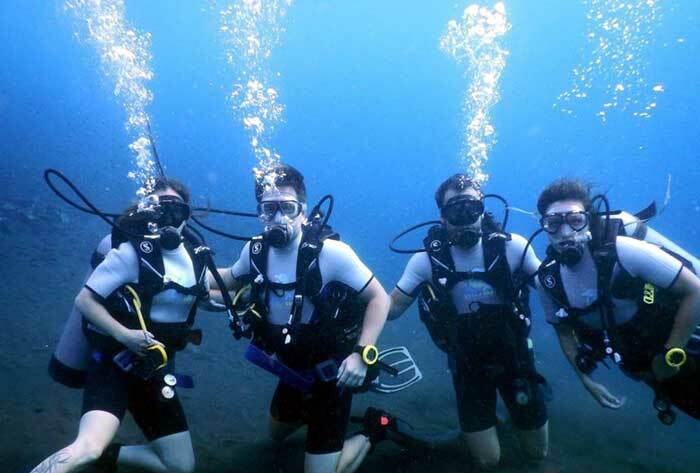 Scuba diving has experienced a tremendous upswing in recent years and is now inspiring millions of people. 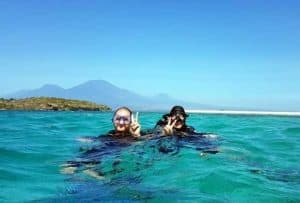 The easy introduction programs in the form of the „Open Water Diver“ course as well as the so-called „Try Scuba Dive“ were and are decisive. 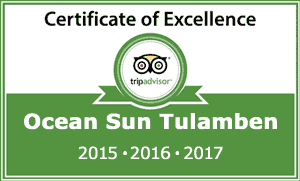 Tulamben is an ideal diving area to get started.The simple dive sites offer much variety. 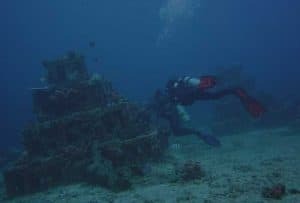 Even the famous Liberty wreck and a wall are visited during the training dives.The short distances to the individual dive spots guarantee sufficient time between the training units, which contributes to a relaxed atmosphere. With our pool and multimedia equipment in the classroom, we offer the ideal environment in the resort. We carefully pay attention to individuality and keep our groups small. Many years of practice and experience complete the service and guarantee an unforgettable experience as well as a new hobby. This short program gives you the opportunity to test whether diving is right for you. All prices are per person and are based on a double occupancy of the bungalows. Prices for individuals please requests separate. 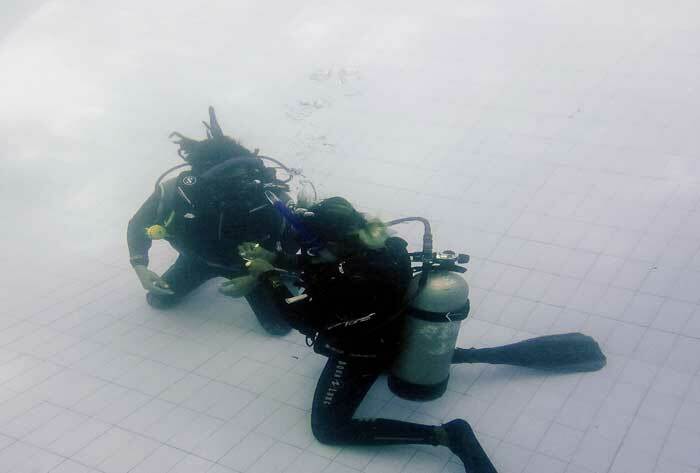 The SSI TryScuba program includes an accident insurance free of charge for the duration of the training. Enjoy the so-called discover dive course with an overnight stay in one of our bungalows. 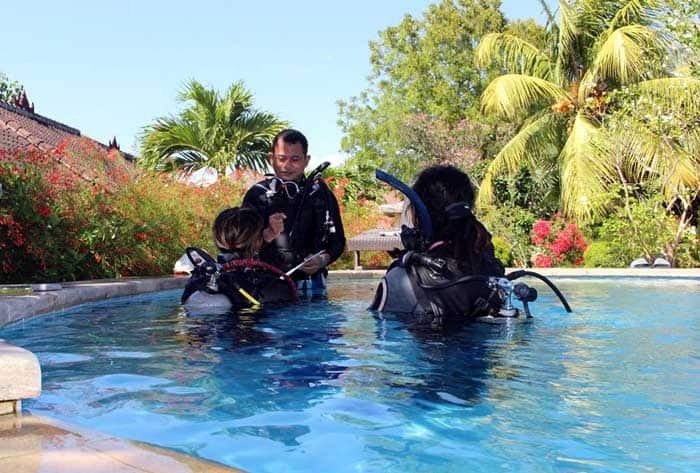 The ALL IN package provides you with everything related to the Try Scuba program. 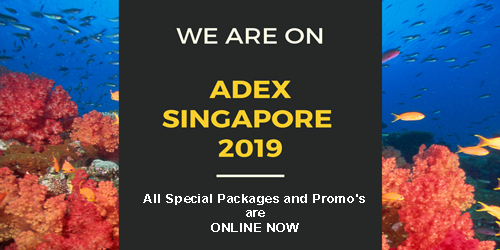 So in addition to this package, the transfers are included..
An one-day program with a pool training and an open water dive are offers you the Basic Diver. The SSI Basic Diver program includes an accident insurance free of charge for the duration of the training. The basic diver course including 1 night in one of our cozy bungalows. The ALL IN package provides you with everything related to the Basic Diver program. So in addition to this package, the transfers are included. This course is the first experience level to this increasingly popular sport. The Open Water Diver course with two nights in one of our cozy bungalows. The ALL IN package provides you with everything related to the Open Water program. So in addition to this package, the transfers and are included. During five open water dives we will introduce different activities to you. Watch out! After the Open Water course no accident insurance is included in the programs. On request we will be pleased to provide further information on insurance and diving. 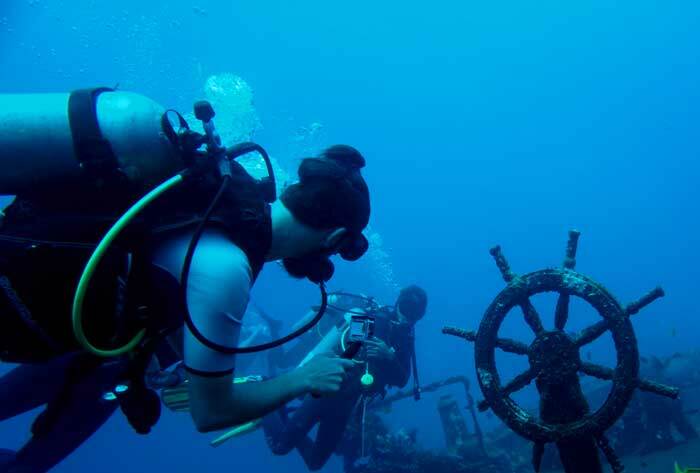 Try five different dive activities and enjoy our service with an overnight stay in the resort. The ALL IN package provides you with everything related to the Open Water program. So in addition to this package, the transfers are included. You’re, not sure Scuba diving is right for you? With Try Scuba you can find out. 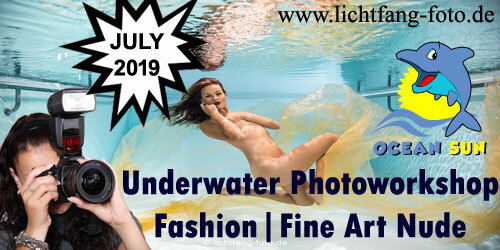 During this one-day course you will try your first “steps” underwater in the pool. 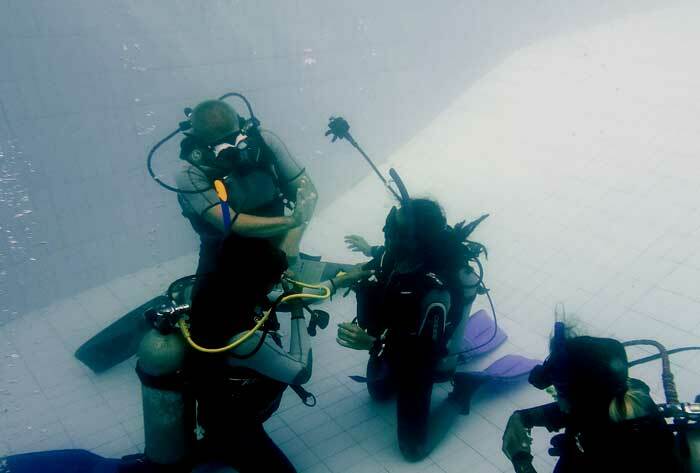 It teaches basic skills and theoretical knowledge for diving. Attention, this program does not include a dive in open water! If you have fun in this short program and if you enjoy diving in this program, the training can be easily extended to the Basic Diver program. 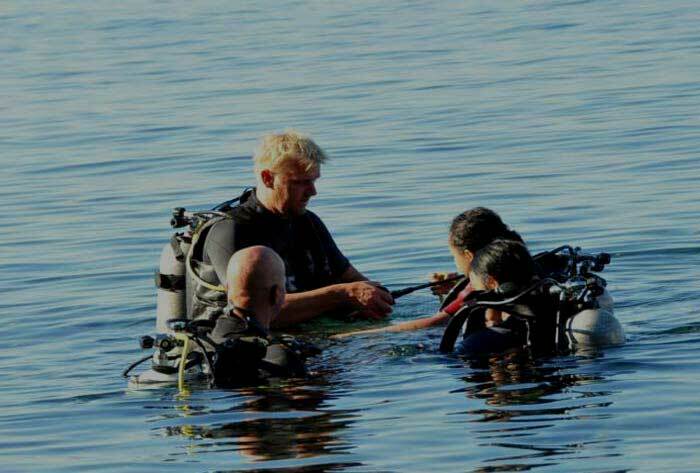 The Basic Diver course offers you the first open water dive. An overnight stay in one of our cozy bungalows including breakfast and a free WiFi access completes this offer. This course is the entry into this increasingly popular sport.The course includes theory sessions, training in the pool and four dives in the open water.The course recommended length is three to five days which we will adjust according to your needs. The training in the pool teaches you basic skills and prepares you for your first open water experience.Thanks to the digital revolution of SSI, you get the theoretical foundations in advance to be prepared once the practical training starts. We associate many theoretical explanations with practical experiences. This gives us more time for the dives in the sea and increases the fun factor. 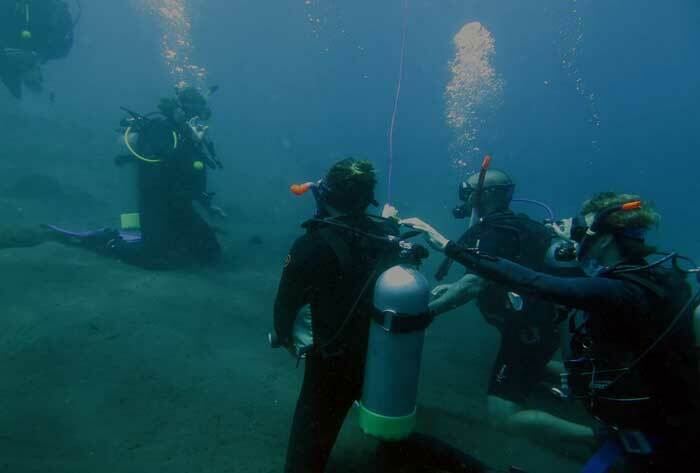 The dive area is perfect for a beginner training and offers many variety. We even visit the famous “Liberty Wreck” as part of the training. Other places offer unforgettable diving experiences right from the beginning as well. Individuality is important to us, so we keep our groups small. Our resort and Bali’s flair offer ideal environment for the course. The certification is easy and therefore you will hold the coveted OWD card in your hands immediately after successful completion. How can I improve my buoyancy? What does the dive site look like at night? What is there to discover at a depth of 30 meters? 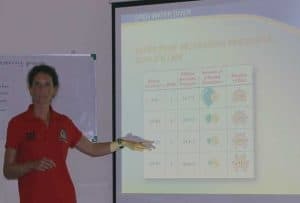 During the Advanced Adventurer course, you will get the answers to these and many other questions. In this 2-day program we will introduce various activities of the diving sport to you. 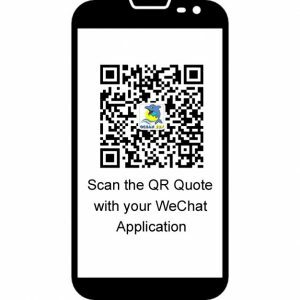 Here you have a free choice between the offered activities. 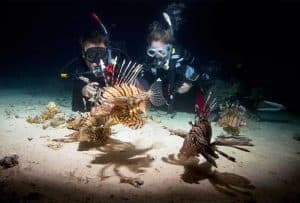 Noteworthy is the night dive or your first experience in deep diving.During the course we will complete five dives, each covering a specific topic. 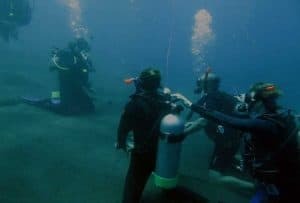 The dives improve your skills as a diver and increase the fun factor as well as the safety.With deep dive, this certification extends your depth limit to 30 meters.This certification is not a new level of experience in the SSI system. Therefore, this course is a certification that is not required on the way to SSI Advanced Open Water Diver or SSI Master Diver. Therefore, this course is a certification that is not required on the way to SSI Advanced Open Water Diver or SSI Master Diver. An overnight stay in one of our cozy bungalows including breakfast and a free WiFi access completes this offer. Furthermore, this package includes transfers on arrival and departure from and to any destination in Bali. An overnight stay in one of our cozy bungalows including breakfast, lunch, dinner, soft drinks and a free WiFi access completes this offer. In the following open water dive, you can try what you have learned in the pool under real conditions with professional support.If you feel like getting more, this dive can be counted towards the Open Water course. 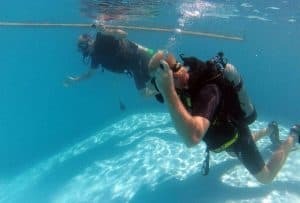 Pool, theory and dive training is the same training you would do on the first day of an Open Water Diver course. 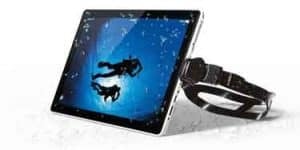 Therefore, the Basic Diver can credited towards the Open Water Course and you can easily continue the Basic Diver program as an Open Water Diver program at an any SSI dive center worldwide. Attention, the credit of Basic Divers to the Open Diver course is limited to 6 months. During the Advanced Adventurer course, you will get the answers to these and many other questions. In this 2-day program we will introduce various activities of the diving sport to you. Here you have a free choice between the offered activities. Noteworthy is the night dive or your first experience in deep diving.During the course we will complete five dives, each covering a specific topic. The dives improve your skills as a diver and increase the fun factor as well as the safety.With deep dive, this certification extends your depth limit to 30 meters.This certification is not a new level of experience in the SSI system. 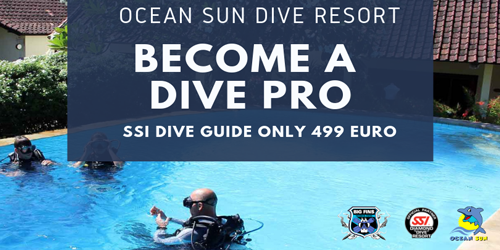 Therefore, this course is a certification that is not required on the way to SSI Advanced Open Water Diver or SSI Master Diver.